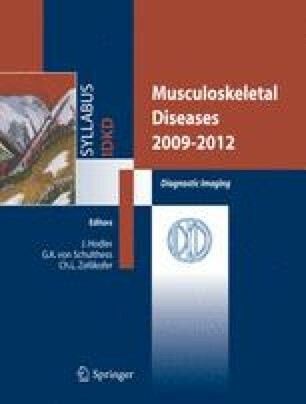 Musculoskeletal ultrasound (US) applications continue to show considerable expansion mainly because of technical improvements (development of high-frequency broadband transducers, refined focusing, and sensitive colour and power Doppler technology) and the growing interest of musculoskeletal radiologists. Its low cost, non-invasivity, and possibility to perform the examination directly, e.g., in sport fields, are additional qualities appreciated by the patients. Up to-date, high-level equipment allows the detection of normal anatomic details and identification of a variety of pathologic conditions [1, 2, 3]. The possibility to perform a dynamic examination is a specific advantage of US compared to magnetic resonance imaging (MRI) and computed tomography (CT). The introduction of extended-field-of-view technology has allowed the realization of images of larger segments and has facilitated their interpretation by the referring physician. The main disadvantages of US are its limited assessment of internal structures of the joints, bones, and bone marrow.